Defining any meeting, board or otherwise, as good based on the predictability of its course and outcome could not be a greater antithesis of a meeting worth attending, which is what defines a good meeting for me. That said, it is possible to interpret this statement in two ways, neither of which is positive. For one, it could be suggesting that no new ground is ever covered in a meeting and participants always play their same roles, saying the same things, and nothing ever moves forward. For example, the naysayer is always there to shut things down; the accuser there to point the blame elsewhere; the bureaucrat there to make sure the rules are followed to the letter; the referee there to shut down any conversation that smacks of a difference of opinion, and so on. The other interpretation, and the one I knew the person was putting out there, was that the executive director so tightly controlled the meetings, and the board, that s/he knew the exact path and outcomes. A nonprofit board meeting with such predictability is not just an horrific meeting, but one that signals that the board couldn’t possibly be doing what it is supposed to be doing and that the executive director has overextended her/his reach and is running a dictatorship. Far too many nonprofits get the purpose of a board meeting totally wrong. Remember: they are called board meetings. In other words, they are meetings for the board to do its work. 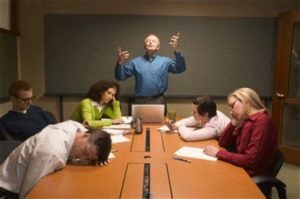 Thus, when a board meeting is dominated by the executive director or other staff who do most, or all, of the talking, there is no space for the board to do its work. When a board meeting consists of board members sitting passively being talked at—rather than engaged—listening to reports, be they from the executive director, committees or anyone else, the board is not doing its work. Understand that the information contained in reports, regardless of the authors, is valuable material that a board needs to have to do its work. But the collecting of that information is the homework a board needs to do in advance of a board (or committee) meeting; not the work that should be done at the meeting. Rather, board meetings should be the locus for having those strategic and generative discussions on the implications of that information. When the focus of board meetings is reports, the board is looking backwards, as the reports are about things that have already been done. Boards need to be focusing on the future—securing the future for the fulfillment of mission promises. (To do this well, a board absolutely needs to know about the past, but as data to inform thinking; not the content of a board meeting.) If a board is doing its proper job and doing it well, no one, especially an executive director, could possibly know the outcome of a meeting. Let’s be perfectly clear here: there is something wrong with an executive director who would want that level of predictability about any meeting, let alone a board or committee meeting. The whole idea behind a meeting is that multiple people with different perspectives, backgrounds, experiences, etc., get together and collectively figure something out. This is the beauty and power of a carefully built auxiliary brain trust—which is what such a built board and a committee are. One person’s brain, one person working alone, doesn’t have to do all of the work, have all of the answers, take on all of the responsibility. This is why we talk about a healthy relationship between an executive director and the board as shared leadership. They are in it together; each relying on the other to help, working on things together, stepping forward when their skills are what are in demand, and knowing when to step back when the board’s skills are in demand. An executive director who doesn’t get and appreciate the benefit that a board doing its real job brings to the organization and her/his ability to do her/his own job, is not an executive director I would want. One of the ways that an executive director does control the board is through an all too common practice: setting the agenda for the board meeting. Creating the agenda of a board meeting should never be the work of, or the responsibility of an executive director. Building on the idea that board meetings are one of the two loci where much of a board’s work is done, the board (in this process, generally, it is the board president or executive committee, if there is one, who represents the voice of the board) should work in collaboration with the executive director to set the agenda. I have to wonder when I read bylaws that set out the content of a board agenda, as if, to the point of the question that launched this blog, the exact same things need to be addressed at every board meeting, month after month, year after year. Rather, setting an agenda is about making sure that a board is addressing the timely matters of the moment for the organization, and thinking about the future. That said, regardless of mission, size, age, geography, etc., there are only two agenda items that should always be present on a board meeting agenda: approval of minutes of the last meeting (so you are certain that you are establishing an accurate record of both what the board worked on and how it did its work) and the review of the financial reports. But after those two items, what is important to discuss this month may not still be important next, and what wasn’t important to discuss this month may very well become essential next. Given the way most executive directors and committees work, I know that the presence of something timely begging for the board’s discussion does not happen on a regular and consistent basis, warranting their presence on the monthly meeting agenda. Finally, to be crystal clear: when the executive director is the dominant speaker at a board meeting, the meeting is no longer a board meeting, as there is no space for the board to do its work. Rather, it is like staying after school to do the homework that was done the evening before. Sadly, then, the board will have to reschedule the board meeting so it can actually do its work.